The only thing I can come up with is "hermetically" sealed, which a box like that actually isn't. Could be that it refers to the unpacking of meaning, which is the project of hermeneutics? 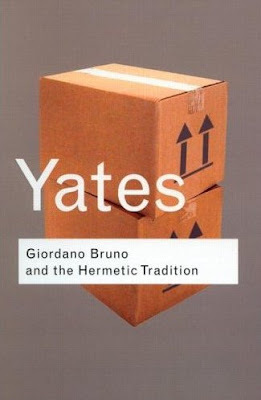 I also thought of the cliche "out of the box" (Bruno being a heretic and free-thinker). The main question for me, though, is not about the image, but this: why is the author's name so front and center? I don't think Francine Yates is the main attraction here. Bruno made some important philosophical contributions to cosmology, including the idea of space and time being infinite, and that the earth was not at the centre of a series of spheres, but that the universe was all "up there", pretty much independent of us. The 'up'-ness of the boxes sort of suggests this.